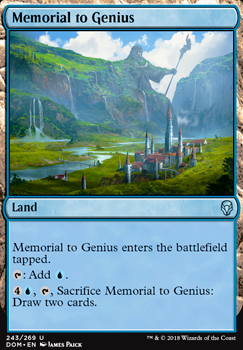 Memorial to Genius enters the battlefield tapped. 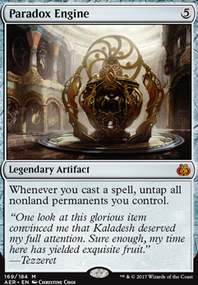 , , Sacrifice Memorial to Genius: Draw two cards. Your land base needs more dual lands or some basic mountains, islands, and swamps to be viable. Dragonskull Summit , Drowned Catacomb , and Sulfur Falls are not nearly effective enough with only 6 lands which can allow them to enter untapped in a deck with 26 lands. 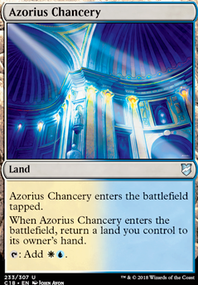 I would cut one of each of those and the Memorial to Genius since you are already running plenty of draw and two Arch of Orazca and add two additional lands either a basic island and a basic mountain or two more shock lands of some combination to allow your lands to more consistently hit the play-mat untapped. Additionally I would recommend starting with removing one Sinister Sabotage , one Mission Briefing , all four Reckless Rage , and all three Moment of Craving . Remove Yawgmoth's Vile Offering as it will be way too inconsistent with such little play ability and such high card cost. I also don't see the value of Rekindling Phoenix in this particular deck, especially when you are already running such a deep mana curve for sorcery, creature, and planeswalker. Perhaps the Lava Coil could be moved to your sideboard for when removal is required. I'd probably take out Memorial to Genius and Sorcerous Spyglass. Search for Azcanta Flip flipped is better than MtG i think, and Unmoored Ego just does Spyglass's job better. I'm also not sure about Deadeye Tracker, I would probably sub that out for Sentinel Totem if you want to exile graveyards or something like Hostage Taker or more Doom Whisperer or even Thoughtbound Phantasm if you need early game board presence. stensiagamekeeper, first off, thank you so much for your suggestions! Do you think Dream Eater could go anywhere in the deck? maybe sideboard in for 2 Thief of Sanity? And I do think there is room to become more counter heavy, what do you think? And lastly, I agree on your choice for Memorial to Genius. Again thank you so much and have a great rest of your day. Looks good. 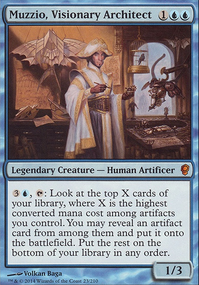 I do have couple of super nit-picky suggestions that could maybe push the power level just a bit (although I play 4 Quasiduplicate and Murmuring Mystics in my UB control deck so this is rich coming from meXD). I prefer 2 Doom Whisperer over 2 Dream Eater specifically in UB as that deck doesn't have the ability to stabilize quite as effectively as UR or URW and is a little lighter on the counters. While a wrath can sometimes get you there usually you're just trading cards with the creature decks until you run out first after drawing more lands. This often means that you end up only stabilizing after you've activated search/recast campaign enough times that you've made up for your higher land count but by that stage it's often too late. Doom Whisperer is a way around this however as it is way better at blocking traffic and giving you a chance to do the search/campaign thing without getting swung at by a bunch of 3/2s. 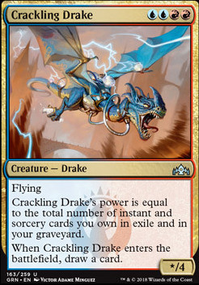 It's also a so-so answer to carnage tyrant btw. Against control the flash does seem better at avoiding counter magic. Something to consider is that if your control opponent sees dream eater they will be more likely to leave in things like Lightning Strike and Lava Coil making Thief of Sanity worse but they'll probably expect it anyways. 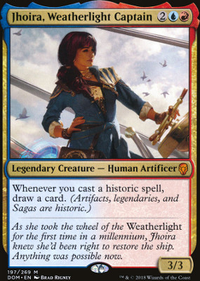 Well, I really like insight for 3 reasons: I can surveil, and Azcanta it and still use it via Flashback, i can cast it 2 times and it draws me 2 cards. This way I can thin out the library more efficient than with the other options... that’s the reason why I chose insight. I will try tomorrow, then I’ll see what adjustments it needs. I started thinking about Memorial to Genius, but by the time I can use the sac ability I shouldn’t need it anymore, and a tapped land in the first 5 turns can be a crucial hindrance i‘m afraid... Thank you for the Input,wakawakawaka Thanks for upvoting! Syncopate is not great as a 4-of. It is really situational. You can use it turn 2 at the earliest, it gets really useless late-game. This deck is simply going to plop against control.You have 5 creatures. The chances you will draw all of them are slim. all of them but Nezahal can be countered. Honestly, Nightveil Predator is baaaad. His casting cost is a pain and he is probably just going to trade once and die. Thief of Sanity is way better, yes he dies to everything but he can quickly turn a game. I would use Doom Whisperer as another big finisher. 6/6 flyer with trample for 5 is already bomb, he also has an ability that is similar to the Big lich. Surveil 2 for free? Yeah! I would drop arch of orzaca and Memorial to Genius. You are running 3 full colors, so somethinng that taps for a colorless is... out of place. The ascend ability is a nice mana-dump, but you will rarely have ascend before turn 11-12. Memorial comes in tapped and will just slow you down. I've found Diamond Mare can be a good fit for decks like this. 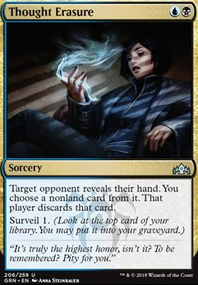 Also with Murmuring Mystic in the deck you might want to consider some mix of Sinister Sabotage and Wizard's Retort. 2-3 of Memorial to Genius could help in the late game. 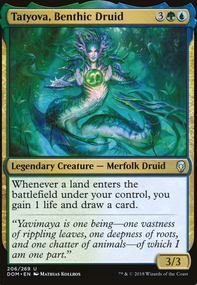 It really requires a dedicated build but if your not aware there is a instant win combo with Drowned Secrets in standard that may tickle your fancy involving Naru Meha, Master Wizard and Release to the Wind.